A married pair of Capitol Hill filmmakers will be premiering their first full-length feature film at SIFF this June. Kris and Lindy Boustedt are the writers, directors, and producers of Perfect 10, an off-beat dramatic comedy that takes place in Capitol Hill and Eastern Washington. It is slated to be shown June 7th and 8th at SIFF Cinema in Seattle Center and will be released online and on DVD through IndieFlix. 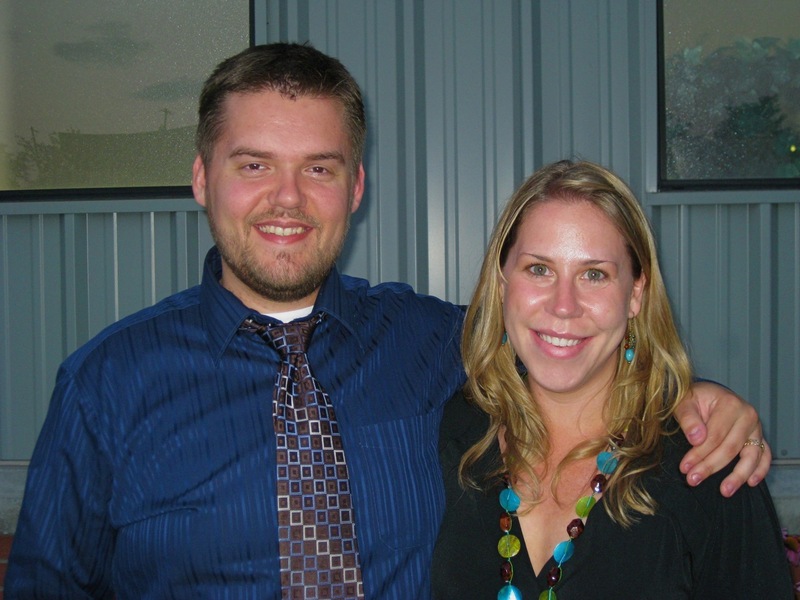 Kris and Lindy met in college where Kris studied film and Lindy studied business. Together they have previously made the short film, Collect All Four, which premiered at SIFF back in 2007. They also wrote, produced, and starred in the web-comedy, Couples Therapy, and are also the creators of First Sight Productions which produces promotional and fundraising films for corporations and non-profits. In addition, Kris teaches film making and film studies at Shoreline Community College. They spoke with CHS about making Perfect 10, staying married, and being part of the Capitol Hill community. CHS: Briefly sum up what Perfect 10 is about and what it means to you as film makers. What did you want to accomplish with this film? Kris Boustedt: The basic plot is about a married woman, hovering between the plus- and regular-sized worlds, going back to her ten-year High School reuinion for a second chance with her unrequited first love. And then discovering that he’s actually come back for her. The film asks that essential question: is what you wish for what you really need? Is the grass greener on the other side, so to speak? We also wanted to deal with the themes of what it means to be desired, how our perception of ourselves is impacted by how others perceive us, and the very nature of trust and honesty in relationships (marriages, friendships, etc). Lindy Boustedt: Short answer – it meant that we could do it – we could make a feature film. From start to finish. That accomplishment alone lets us know that nothing is stopping us in achieving our dreams of being filmmakers. CHS: As your first feature-length film, how has the movie making experience compared to creating short films? Are you going to keep doing it? LB: From my viewpoint I believe that short films are a building block to features. For me I break down a feature into smaller chunks – chunks close to the size of a short film. But, when you are on set it is a whole different story. My brain doesn’t know how to sleep on day 1-13 (out of 14 days of principal photography) when it knows there is still so much to do! That makes it a little difficult to function but luckily the adrenaline keeps me going. Absolutely we will do it again. It may be some of the hardest work we’ve ever done but it is also the most rewarding. I love everything about it – the difficulty is what makes it great. CHS: Your production company, First Sight Productions, mainly creates short films for non-profit corporations. Do you do both types of movie making? What is the relationship between this and Perfect 10? LB: Basically we are storytellers. Whether it is a film for the silver screen or for corporations and non-profits we try to find a story to tell. It all relates. KB: Yep. Story is king. Find it and tell it. CHS: The making of a feature film must be a very expensive thing to do. What was your budget for this film like, and how was it funded? LB: It is expensive and we did it with a very small budget. We don’t really want to say what exactly we paid but we are in the category of Micro-Budget. Perfect 10 was funded primarily by us – self-financed with our bank accounts. But we also had funds contributed by family and friends. It was an 80/20 split – 80 being us. KB: Yeah, we’re certainly not ashamed to say that we got a lot of support from family and friends. It was a great honor that so many people had faith in us. I can’t say enough about the nature of micro-donations. Every $20 or $50 or $100 counts and matters. We couldn’t have done it without them! In fact, in the credits of the film, there is a long list of supporters/friends/fans. We owe them all a huge debt of graditude. The great thing about doing it the way we did (small donations + our own pockets) means we didn’t have to answer to anyone creatively. We could make our movie the way we wanted to, and didn’t have to worry about someone else forcing us to go one way or another with respect to story. CHS: In what ways did a lack of funds limit the vision you had for the film? In what ways did it help? LB: I wouldn’t say it limited us at all. We went in writing the film knowing we would have a limited budget and finding a story that could be told with locations and items we could afford. However, I wish we had more funds to pay our actors and crew more – we paid them a little but I would have liked to pay them a lot. Lack of funds is also being seen in how much we can spend on marketing. I wish we had more money for that. It is also nice, when working with locations, to have a little money to help grease the wheels. When you pay for a location you get a lot more support and flexibility from the location managers/owners. That helps. KB: I couldn’t agree more. “Limit” is an interesting thing…because really, all art or creative endeavors are limited somehow. Usually money. But out of limits, I think, you can do some amazing things. I’ll just add, too, that I am so happy we made the film with limited resources. We learned an unbelievable amount because of how we had to make things work within the confines of time and budget. Great learning experience, great training. Now we know we can do it again, only more efficiently. But yes. If anyone out there is reading this and has money they don’t know what to do with, we’ll take it to pay cast and crew more money on the next film. We need Seattle to be a sustainable filmmaking communtiy for everyone, and that starts with paying cast and crew. CHS: You are both listed as the screenwriter, director, and producer for this movie. How did you split up the duties? Was there a lot of butting heads? LB: The only time we didn’t do things 50/50 were on Pre and Post production. On Pre-production it was more of a 70/30 split with me at 70 and swapped with Kris on Post-production. Then on set since Kris was the DP he was focused on the cameras, the equipment, telling the crew what he needed and getting the shots set up and 30% on the actors. I was 70/30 with my focus being on the actors and 30% on the shot/equipment/etc. We definitely want to change this for the next feature. Hire a separate DP so Kris and I can focus on the actors together. KB: And, I mean, we’d be remiss if we didn’t say that yes, sometimes we argued. Heck, we’re married AND working together AND doubling up on certain jobs. But, really early on in the process we actually sat down and said that we could argue as long as we were arguing for the betterment of the film, and as long as we both recognized that the other person was doing the same thing. This way we could disagree in a safe place. CHS: You have described Perfect 10 as semi-autobiographical. Since the movie is partially about a desire for an extramarital affair, how difficult was it to work together as a couple? Do you feel as if the movie is airing your dirty laundry in a way? Was it scary or cathartic? LB:It wasn’t difficult at all. Because we know that every marriage goes through these situations – even if they don’t talk about them. I think if anything it was really healthy for us to write these situations and really talk about what they mean, what the characters mean, etc. And also, I don’t know if the movie is really airing any dirty laundry since we don’t feel it is “dirty” per-say. We feel it is honest and real. KB: Yeah. Perhaps I’m going out on a total limb here, but I think it’s safe to say that married people who say they never think about what it would like to be with someone else are lying. Is it weird that we made a movie about it, based on our own experiences? Maybe…but, hey, we’re still married! We really feel that the need to be desired is an extremely powerful, universal force; one that we don’t think anyone can truly escape. Now, whether you act on that, or are duplicitous about it…that’s an entirely different story. You are residents of Capitol Hill and part of the film and a lot of scenery in the movie is based in Capitol Hill. Was there a reason in particular you focused on this locale? LB: We love living and working on Capitol Hill. So when we were deciding how to visualize Seattle for that portion of the movie we wanted to show the view point from the neighborhood we live in. It was a very purposeful choice to do so and makes it have a special Seattle feel. CHS: The soundtrack also seems to have some connections to Capitol Hill. How did you find most of your music? LB: Well, one of our singer/songwriters lives on Capitol Hill – Wonder Russell. And we met her through the casting process as she not only sings on the soundtrack but plays the Liz Stone character. We really lucked out finding her! We found the rest of the music through musicians we know – the Brook Lee Catastrope has a drummer that is a dear friend (Mike Duncan) and also plays the Stoner character in the film. And the other two groups, Ahn Trio and Cloud Cult, are favorites of ours. CHS: Your first feature length film is going to be premiered here locally at the largest film festival in the United States. That must be quite a sensation. Are you nervous? KW: I now wake up every day kind of wanting to poop myself. LB: Nervous but completely excited!! I love that we are having our World Premiere in our city. KB: Yeah. It is completely, utterly, fantastically awesome. CHS: What have you been doing to prepare for SIFF since finding out about being accepted? LB: We have been getting the word out to the press and getting our ducks in a row to promote the crap out of it once the festival starts – we need to get people to our screenings! Also, we’ve been building a partnership with IndieFlix. 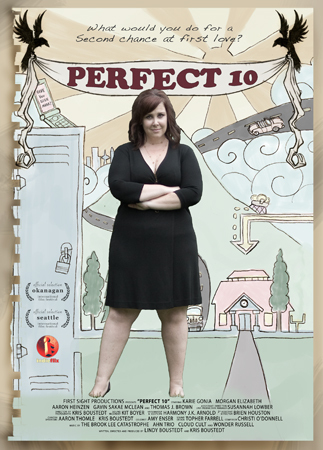 They are going to help us release Perfect 10 on DVD which will be available at our SIFF screenings for those who join us and online the day after we screen – June 9th. CHS: You also have had a short film, Collect All Four, show at SIFF a few years ago. What was it like to be a part of such a large festival? LB: It was magical, amazing, life changing. To be a filmmaker in a festival we’ve been going to for years. We admire the art of film so much and it was great to finally be categorized fellow filmmakers. CHS: What is next for Perfect 10 after SIFF? LB: The DVD release online and further festival screenings! The next festival on the list is the Okanagan International Film Festival in Kelowna, BC in July. CHS: What is next for you two after Perfect 10? LB: We are writing our next feature film! We hope to have the script finished by the end of this summer, start pre-production this fall/winter and film it early 2011. KB: It’s kind of funny. For the rest of our lives, the answer to this question will always be the same. “What’s next?” “Another film.” It’s a never ending cycle. And we LOVE it. Actually Perfect 10 will play on June 7th & June 8th at SIFF. Tickets will be available on May 7th!